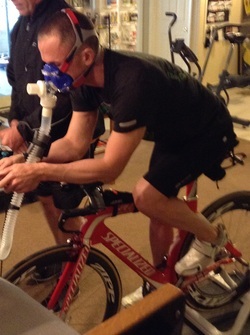 VO2 & Metabolic Testing $150.00 (Cycling or Running). It is a common mis-perception that we only burn fat or carbohydrate during exercise. The opposite is true across most intensity levels.... We use both carbohydrate and fat to fuel exercise up to maximal intensities. The percentage of macronutrient will depend on individual characteristics, most notably exercise and nutrition adaptations. An athlete who is more aerobically conditioned can use more fat as energy at higher intensities and this can provide a glycogen sparing effect (preserving internal stores of carbohydrate). Consuming a high carbohydrate diet or doing too much high intensity training at inappropriate times of the year can reduce metabolic efficiency. Metabolic efficiency can be easily manipulated in a rather short amount of time. It is difficult to predict an athlete’s metabolic efficiency without formal metabolic testing. The information from metabolic testing is crucial for designing a training and nutrition program to improve metabolic efficiency. .... So in accordance with Bob Seebohar's guidelines and recommendations, it is critical to know how metabolically efficient you are prior to going into competition or special operations assessment courses. From a metabolic test you can find how many sugars to fat you are burning during various intensity levels. The metabolic test will also provide information in establishing training and nutrition strategies. I have seen upto 20 percent improvement with many of my clients within a very short time frame, but it is critical to perfrom a metabolic test to fully understand your abilities. I recommend to my clients that are sugar burners to reboot their training and nutrition to become more metabolically efficient. One great nutrition product is Generation UCAN. I can easilly explain the benefits of this product, but Bob Seebohar does a great job in this video. If you want to try Generation UCAN, I will be happy to help you. "Visit generationucan.com/velosmart to learn more and save 15% on your UCAN order."